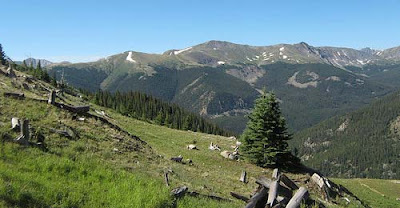 I’ll be writing a few posts on our 2008 backpacking trip to the Collegiate Peaks Wilderness in Colorado. You can see a Google Map of our hike and all of the pictures of from our trip on Flickr. Our hiking today was relatively short, and all downhill… a first for us on this trip. Steph, Josh, Rachel, and I started out early right after breakfast. The hike down to the Piney Creek trail-head went fairly fast – almost a relaxing walk. Josh and I made it down to the parking lot first, and our job was to drive my car to Cottonwood Pass to pick up our parent’s car. That process took 30 minutes and by the time we got back Rachel and Steph had just finished packing out. Mom and Dad arrived a short time later and then it was time for the drive to Colorado Springs. After a long drive we checked into our hotel, showered up, and then went looking for food. This is my second favorite part of a backpacking trip: prime rib following the trip. We went to Outback and ate way too much. So that’s it. Collegiate Peaks Wilderness backpacking trip done and in the bag… er, the backpack. I don’t think any of us realized just how difficult climbing Mt. Yale would be – oh my gosh…. We woke up at 6:30 and made an early breakfast. We did not have to break camp, so we just packed up day packs with a minimal amount of food. The hike up Mt. Yale was a 3.6 mile trek from our base-camp that rose over 3,200 feet. Mt. Yale is 14,192 feet high. There was not one part of the trip that was easy. In the first part the path was tree-covered, but the path was still steep with a lot of switchbacks. Once we broke tree line (at 12,000 feet) the trail got immensely more difficult. Josh broke head and did not stop until he reached the top. Mom, Dad and Rachel hung behind – Rachel was feeling a little sick at times, but she stuck it out. Steph and I were in the middle, and Steph was amazingly strong. In the lower part, just above tree line, the trail was wide and almost all gravel. It then turned to a scattered boulder field, and finally near the saddle a long string of rocky switchbacks. Every step up was painful and required tremendous effort. Most of the time the trail was at a 45-degree angle, and sometimes even steeper. There was no break or flat part – it was always up. Steph tended to climb for quick intervals and then take short breaks often. I tended to be more slow (really slow), but tried to climb for longer periods. In the end we were climbing at about the same pace. The saddle was a flat gravely area just below the last 100 feet of large boulder mass (the summit). When we reached the saddle we could finally see the other sde – Mt. Harvard and the town of Buena Vista were ahead of us. A small airplane was actually flying below us! At this point a guy name Doug made it up to the saddle with his awesome dog Charlie Brown. Doug has climbed eight 14ers and Charlie Brown has climbed 4! Coolest dog ever with a lot of energy at 14,000 feet… he even chased a marmot around the saddle. Next we tackled the summit which was a large, rocky boulder mass, the trail marked by kairns. This took some delicate scrambling, but a welcome change from the hiking. Finally we reached the peak, and the view was magnificent. We could see in 360 degrees for up to 100 miles. We could see Pikes Peak and the Texas Creek Reservoir. After an hour spent on the summit we began the trek down. This was hard too and wore badly on my feet. It took half as long to go down as it did to go up (which took 5.5 hours), but felt like an eternity longer. The worst part was once we got down from the Yale trail we had to hike up another 300 feet to our campsite. Torture. But the pain was worth it and the view from the top, incredible. Tomorrow we pack out, then hotels, showers, and prime rib. Today was definitely the hardest and most difficult day yet, but the most rewarding. We left Texas Creek at 9:30 this morning and started hiking towards Brown’s Pass – a full 1,000 feet climb in elevation. Not gonna lie – it was pretty difficult at times. Saw some great scenery today on the way up including a couple boulder fields which were a nice backdrop against the canyons below. Near the top was an old gold miner’s cabin that had been destroyed – the roof caved in and house sunken below the foundation. Finally around noon the low valley of the pass came into view… my favorite part of any backpacking trip. I love watching the next mountain range come into view from across the pass, and you can always see for miles and miles. I was the first one to the top, so I set up my camera to take pictures of each person in our group as they approach the pass. Once everyone was on top we grabbed a quick lunch and took some photographs. We also met a couple other groups at the top, including a youth group from Austin, MN. Going down the pass was 10 times easier and faster. We found a really nice campsite where we met the stream again and spent the rest of the afternoon relaxing there. Steph and I made supper tonight – well really it was Steph – minestrone soup and beef stew. Tomorrow we go up Mt. Yale, sans packs thank goodness. Definitely lighter day today – only 2.5miles – and slightly uphill. It didn’t rain anymore last night, but it was extremely cold, to the point that Steph and I both had trouble sleeping. Our camp last night was a nice open pine setting with some cool boulder formations in the back part sitting at the base of a mountain. We reached a fork in the trail around noon (which was our destination), but required a river crossing to get to the campsite. The girls all waded through the river, but Josh got in his head that we wanted to do some Indiana Jones-style feat by jumping rocks. He also wanted to build a pulley to pass the packs across the river which was entirely unnecessary, but well, why not. Unfortunately the line snapped and Josh snagged his pack just before it went in the river. No harm though – we all just ended up hopping across the rocks and getting over fine. Difficult day tomorrow – our hardest yet, must go up the pass. Today was a difficult day, our first real day of hiking. We began at the Continental Divide and headed north from Cottonwood Pass. Of course, we made a mistake about 20 minutes into our hike and ascended a peak that we didn’t at all need to climb because we lost our trail. Even still, the view from the needless peak was good and we could see down into both sides of the Divide valley, and we could also see our correct trail again from up there. As I suspected, it was quickly apparent that my pack was way too heavy, meaning too much food and too much camera gear. We hiked down from the Divide all day, dropping nearly 1,000 feet or more in elevation. We ate lunch on a ridge right before the major descent began, and we saw the storm clouds starting to roll in. We covered our packs and kept the rain gear handy. The first storm ended up missing us, but we got hit by the second one below tree line. Put the rain gear on quickly and waited it out beneath a grove of trees. The last couple hours of hiking were more hard on my feet and knees. We arrive to camp around 4:00 PM but had to cross Texas Creek first, which was extremely cold, and I had to go across three times. We hurried to set up camp and got everything moved in just before a 3rd rain storm came. no hail this time though as it did during the afternoon. Mom made supper and somehow we got a fire going with wet wood and insect repellent. Today after buying our last supplies in Pueblo, CO and a late lunch at Arby’s – our last meal – we headed west towards Canon City, up the Arkansas River Valley towards Salida. We stopped briefly in Buena Vista and then made our first ascent into the mountains, driving West into the San Isabel National forest, and The Collegiate Peaks Wilderness Area. We’ll spend the next five days hiking the area around the base of Mt. Yale and surrounding peaks with my Dad, Mom, brother (Josh), sister (Rachel), and Steph. Our first night here we’re spending ‘car camping‘ at a roadside campsite – the Denny Creek Campground. It’s relatively cool tonight and overcast – the forecast said it would be about 45-50 degrees tonight . My pack is pretty heavy – definitely the heaviest I’ve ever carried on a trip like this, and my camera gear is to blame. I even dropped 5 lbs of food this morning at the hotel, but it didn’t seem to make a difference. After setting up camp, Dad was in charge of our first camp supper, which was dehydrated spaghetti. And after supper we drove up to Cottonwood Pass to take a few pictures and go for a quick walk. We saw a moose on the drive back down, but it moved too fast between the trees to get a picture. Tomorrow morning we’ll start hiking from the Continental Divide at Cottonwood Pass – elevation 12,000 ft.
As promised, a few posts on our recent backpacking trip are forthcoming, including pictures from the great wide open. My best estimation is that we hiked a total of 20 miles, including a non-pack ascent of Mt. Yale. In backpacking terms, it wasn’t really a long trip distance-wise, but in my opinion it was quite difficult. Maybe I’m just getting old, and sitting in a cubicle 50 hours a week is catching up with me, but several stretches of our trip took lot of effort. But the effort was worth it and the views incredible at multiple points. So over the next few posts as I write about each of our days on the trip I’ll include some pictures, and I’ll refer to my new best friend, the Google Map. Of course, I couldn’t help myself – I had to plot out our route on the map, and I’ll refer to it as I write. If you want to check out our route, you can see it here (and be sure to change the view to ‘Terrain’, it’s more interesting that way).